I spent a first part of my life believing that I could learn all I needed from books, as long as I had the right books and the time to read them. As I began formal magical training, I learned how vital an in-person experience was in learning and found less value in book learning. Now, I feel as though I respect both mediums for their limitations and strengths. 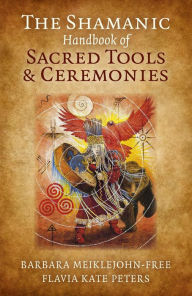 I loved this chance to read The Shamanic Handbook of Sacred Tools and Ceremonies and to consider what gaps it might fill in people’s knowledge. Handbooks are usually recognized as “books of instruction or guidance,” but one of the lesser known definitions is “a guidebook for travelers.” I like the latter definition in this case, because I found this book took me on a journey through the world of shamanism, its tools, and its landmarks. It provides information about the history and knowledge of shamanism, complete with a mini-glossary, in addition to some experiential exercises. This book quickly drew me in, written in an engaging style. Chapters are clearly ordered into topics for convenience, including Incense Sticks, Plant Medicine Teachers, and Divination. It was very refreshing to find the authors frequently reference their own cultural viewpoints and carefully point out that cultural differences influence practices, so as not to assume that one’s own way is “the right one.” Snippets of stories from the path of each author flesh out this book. My only criticisms are mild ones. I personally wish that the authors had explained in- depth their cultural viewpoints and described their paths in the very beginning of the book, as another way of illustrating how our culture and experiences affect how we think. While they do talk about their paths, I found it more of an aside, rather than straight up-front. I also would have enjoyed even more storytelling of their own lives; perhaps there might be a place for that in their second book? I believe that a wide range of readers, from those new to this topic to those looking to add to their repertoire, could benefit from and, even more, enjoy this delightful handbook.